Expert videos on the transition from hospital to home after a spinal cord injury. Learn about preparing a home for someone in a wheel chair and safety risks. What should families expect when a person with a spinal cord injury comes home? What home modifications are necessary for someone using a wheelchair? What are the most important safety issues in the bathroom? 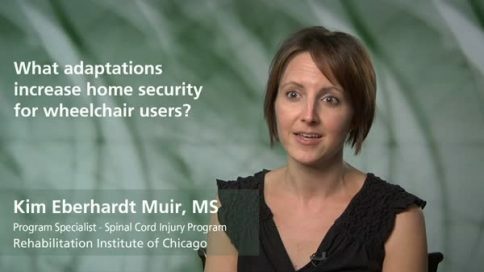 What adaptations increase home security for wheelchair users? What are some options for making transfers at home? How do "adaptive devices" help with everyday activities? What are some "low tech" devices that can make homes more accessible? How does "assistive technology" help with everyday activities? What are the causes of pressure sores in people with spinal cord injuries? What's the best way to do daily skin inspections? How frequently should discharged patients return for a rehab "tune-up"? What's important to know about traveling with a disability?